High-quality documentation is not just essential for getting products ready to market and to increase sales, but also for reducing localisation costs. Localisation, the process of adapting your content to a specific market, starts with preparing the source content linguistically and functionally. To ensure global success, you must consider how the quality of your source content impacts the speed and quality of the localisation process. This post provides guidelines on language and layout to help you write localisation-friendly source content. Linguistically, how can you prepare your source content for more efficient and cost-effective translation? First, let’s consider the features of localisation-friendly source content. Localised content in the target language can only be as good as the source content allows. A well-known rule of thumb in the Information and Communications Technology industry states: ‘garbage in, garbage out‘. Lower quality source content slows down the localisation process, diverting time and resources. Conversely, accurate source content produces fewer linguistic bugs, greatly reducing localisation time. Furthermore, inaccurate instructions in the target language result in higher support costs for your product. If your language service providers (LSPs) struggle to understand the content, the end user is going to have difficulty also. This may well lead to unnecessary requests for customer support. Localisation relies on Computer Assisted Translation (CAT) tools such as translation memories and machine translation engines. By using a limited set of terms repeatedly, you can benefit from the cost efficiencies of automated translation. The result is a reduction in manual translation, which incurs charges on a ‘per word’ basis. To maintain consistency of style and terminology, your documentation team should develop and adhere to a glossary of commonly used words and phrases. You can then share that glossary with your LSP. Make your writing less time-consuming to read and localise by removing any unnecessary text. Use the present tense where possible. Tenses other than the present tense often have more components than just one verb across different languages, resulting in a higher word count to translate. English The exit button appears. The exit button will appear. German Die Exit-Taste erscheint. Die Exit-Taste wird erscheinen. Imperatives are the simplest and shortest way of conveying instructions in many languages. English Select Exit. Exit should be clicked. German Wähle Beenden. Beenden sollte gewählt werden. Avoid negative phrasing and double negatives. Over-reliance on negative phrasing increases your word count. Word count: 3 Do not use negative phrasing. Word count: 3 Verwende keine negativen Formulierungen. Use the active rather than passive voice. The passive voice has a higher word count than the active voice in many languages. English A dialogue box displays the settings. Word count: 6 The settings are displayed in a dialogue box. German Ein Dialogfeld zeigt die Einstellungen. Word count: 5 Die Einstellungen werden in einem Dialogfeld gezeigt. Unless abbreviations or acronyms are widely used across languages, use the full version or an equivalent translatable term. German Mehrwertsteuer = MwSt Für Ihre Information = ??? In today’s world, content is most likely to be delivered in digital form. Therefore, it is crucial to take into account how digitalisation affects the layout of your content when localised. It is best practice to prepare textual and graphical elements in the following ways. Depending on the language, your source material increases or decreases in length when translated. English text is often very condensed, meaning that translating from English into another language results in a longer target text. From English to German, text expands between 10 and 35 percent, depending on the subject area. To plan for this level of text expansion from the start, think about the size of fonts, margins, and user interface elements such as buttons and tabs. Being aware of these factors early in the process helps to pre-empt localisation issues later. As the saying goes, ‘a picture is worth a thousand words’. Graphics help decrease localisation costs for documentation because they can make instructions easily understood without much explanation. 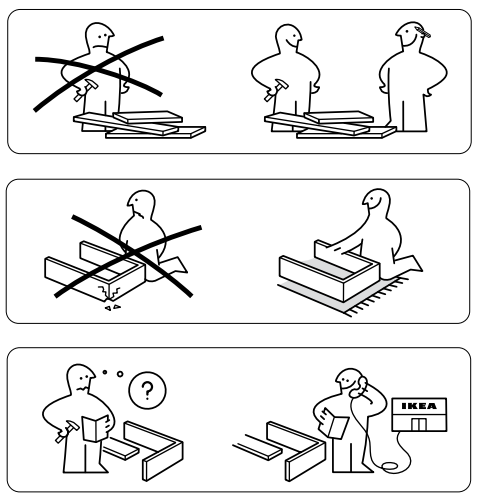 When IKEA switched to pictures-only instruction manuals, the company probably had similar reasons. Although, as the manual for the Pax Lyngdal Sliding Door points out, you might still need to ring customer support if you don’t get far with the manual. However, when using graphics in your source documentation, be careful when combining them with text. As a general rule, use editable, non-embedded graphics. Where possible avoid including text in graphics. Instead of embedding labels in graphics, place them above or below the graphic. If you use screenshots as graphics, be sure to secure access to the localised version of the software or tool you are documenting. Exercise caution with region-specific symbols. For example, the information symbol works well across the European market but not as well in Asia, as it is based on a letter of the Latin alphabet. Another example of symbols or icons that don’t translate well is the shopping cart. In countries where people rarely use shopping carts, this symbol means very little. Internationally agreed ISO standards (ISO ISO/IEC 11581-10) on which icons and symbols work across languages can help circumvent these issues. A few simple steps at the authoring stage can save money and time in your localisation process. After all, who needs the embarrassment of another badly localised or translated manual? Feel free to share any additional tips you have on preparing source content for localisation. If you want to learn more about how to create quality source content, check out our effective writing skills and introduction to technical writing training courses. Rita Szymczak is a technical writer and instructional designer with TWi. She has a BA in Applied Languages with Computing from the University of Limerick. In 2009, she received a scholarship for her research contribution in Sociolinguistics from the UL School of Languages, Literature, Culture and Communication. She has worked in language teaching, e-learning, localisation project management, and technical communication.